South Bank's iconic Parklands precinct (photo: Fullframe Photography). From meeting place to rowdy port to cultural centre, South Bank has seen its fair share of action over the years, but it’s much more than just a public space. As I stare at the retina-distorting pink neon glow of Mr Fitz, the stickiness of my banana, bacon and brown sugar cone dripping through my fingers, I’m pondering how places can become ideas. Because South Bank is as much a concept – occupying the hearts and minds of Brisbanites – as it is a physical place. For most, the glittering fanfare of Expo ’88 and the world attention it received is what put South Bank on the map, but its patchwork history stretches back much further than that – back to before John Oxley sailed upriver from Moreton Bay in 1823, in fact. 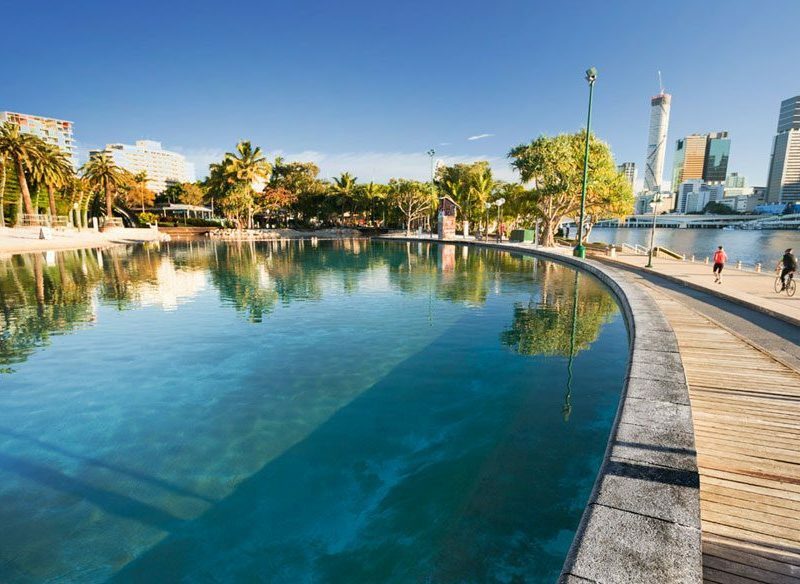 Originally an important meeting place for traditional landowners, the Turrbal and Jagera people, South Bank became a bustling port, and the first of Brisbane’s CBDs. When the city shifted to higher ground on the northern banks of the river after a catastrophic (although in hindsight, not unique) flood event in 1893, the vaudeville theatres, boarding houses and warehouses took its place. That marked the beginning of South Bank’s identity crisis. It wasn’t until the 1970s, when it evolved from debauched bohemian entertainment spot to culture hub in the making, that its potential was fully realised. Now the mash-up of cafes, offices, parklands, galleries and performing arts institutions is sprawled languidly along the southern banks of Brisbane’s snaking river. I make my start at the historic Queensland Maritime Museum that, according to news reports, will soon become a $100-million aquarium butted up against the swirling eddies of the Brisbane River. Head up the slip road from here to the Ship Inn, where rowdy sailors used to take their tipple, for a gastro-pub meal in one of the precinct’s oldest buildings. In 1992, the South Bank Parklands waterway was replaced with one kilometre of towering wrought-iron archway that curls skyward, covered in an eye-popping blanket of magenta bougainvillea (photo: Fullframe Photography). The route through the Parklands splinters from here but if you choose the Arbour, you’ll be walking the path of an Expo canal that carried excited visitors in boat rides. In 1992 the waterway was replaced with one kilometre of towering wrought-iron archway that curls skyward, covered in an eye-popping blanket of magenta bougainvillea. Peel left off the path towards the River Quay Green, a lush, grassed amphitheatre ringed by five of Brisbane’s finest restaurants: Stokehouse, Popolo, Aquitaine and The Jetty. Towards the River Quay Green is a lush, grassed amphitheatre ringed by five of Brisbane’s finest restaurants including Stokehouse (pictured). The green is filled with people soaking up both the sun and the impressive view back to the CBD. Take the Riverside path through Epicurious Garden, an abundant public organic vegetable garden, which is tended to by a team of volunteer gardeners three days a week. From Tuesday to Thursday (7am to 2am), the ‘harvest cart’ is overflowing with free vegetables so take your pick. Up past the Arbour, the breezeways connecting Grey Street to parallel Little Stanley Street hold their own treasures. At the southern end sits what I’ve dubbed ‘American Beer-lovers Alley’ for the quartet of Stateside-inspired craft beer spots: Hop & Pickle, Tippler’s Tap, The Manhattan Line and Bourbon Street. Tippler’s Tap’s cabin-in-the-woods decor perfectly suits the bearded lumberjack look sported by its male clientele. It’s a serious beer nerd’s haunt where 13 taps – filled with hoppy ales, pilsners and lagers from small breweries – sit alongside a complementary beer nibbles menu. Try anything from the Garage Project with Tippler’s Chicken Wings or the Chicago Dog. Across the road, steam rises in white sheets as chefs go about their dumpling-making business behind a window looking into the kitchen of Bamboo Basket. For the best local Japanese cuisine, you can’t go past Bamboo Basket. The multicultural eats continue at slick souvlaki newcomer Zeus, next to the sugar-loaded trio of Mr Fitz Ice Cream, Doughnut Time and Chester Street Kitchen. Food done with (for now) I head to the cobblestoned plaza running towards the river. At the end of Stanley Street Plaza, which holds The Collective Markets weekly, you’ll find South Bank’s most unusual attraction, Streets Beach. You’ll find the weekly Collective Markets at the end of Stanley Street Plaza (photo: Dylan Evans). Described as ‘Australia’s only inner-city beach’, it’s actually a chlorinated public pool boasting real sand and its own surf club. It may be a gimmick aimed at delighting tourists but, when the mercury heads towards 40, it’s a welcome beach alternative. Follow the Arbour past Queensland Symphony Orchestra and Opera Queensland and, if the timing works, check out one of their regular events like ‘QSO Sundowners: Beers + Beethoven’. At Arbour’s end you’ll come to the Cultural Forecourt which, flanked by QAGOMA, the Queensland Performing Arts Centre, and State Library, is the central point of this cultural hub. South Bank’s most unusual attraction, Streets Beach, is actually a chlorinated public pool boasting real sand and its own surf club. Cutting across three blocks running back to West End, I find newly minted hub of hip, Fish Lane. Gauge makes a convincing case for locavore eating through its pared-back, produce-driven menu; but you’ll have to line up for a table at authentic Italian eatery Julius Pizzeria, serving the best duck ragu and thin-crust pizza I’ve eaten outside of Italy. Next door, tiny secret bar Maker may only fit a handful of people into its doors but the bartenders here know how to pair ingredients like dripped pork fat and pineapple, to create a cocktail ode to Queensland summers. Across Cordelia Street, Saccharomyces Beer Café is a loving nod to the yeast that makes your beer brew but also a great place to grab a morning coffee, and when I wander past it’s buzzing thanks to the weekly trivia evening. Further down the lane, the near-complete residential tower, Melbourne Residences, is waiting to welcome cult gelateria, Gelato Messina, come October. By the time I reach it, the Gallery of Modern Art is closed for the day and the commanding contemporary building serves to highlight how much South Bank has transformed, in one sense. But in another, it remains that same hallowed meeting place that once drew the Jagera and Turrbal people to its shady shores, thousands of years before.